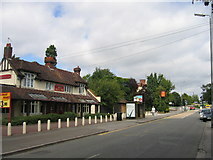 There were always several shops in Tile Hill Village. 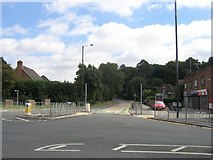 Opposite Tanyards Farm on the corner of Station Avenue was a house where the HILLs sold provisions in their front room. Nearby was BATES the Butchers. Opposite that on the corner of Tile Hill Lane was the SMITHs shop and a Garage. Just along the lane were a few more modern shops [see first pic below]. Back along Station Avenue, just past the Bell Inn was a Draper's shop, a Newsagents and a Barber. Opposite that was Westwood Vicarage and Church Hall. end of Tile Hill Lane at Tile Hill Village © Copyright David Stowell and licensed for reuse under this Creative Commons Licence. The Bell Inn, Station Avenue, Tile Hill Village © Copyright David Stowell and licensed for reuse under this Creative Commons Licence. 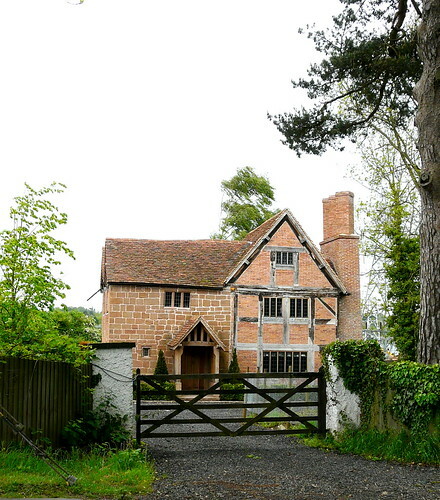 A WALK THROUGH 19thC TILE HILL ... Arriving by train at Tile Hill Station from Coventry, firstly we cross the line to our right, then follow Station Avenue downhill into Tile Hill Village, passing Duggins Lane to the left. We pass "Westwood Vicarage" to our right and the "Bell Inn" on our left, then cross over Tile Hill Lane junction into Banner Lane ["Tanyard Farm" is on the left]. A gradual rise takes us to a farmhouse at the top of the hill to the left ["Connoway Farm"], then falls and crosses a little stream. Up another gentle incline for about a hundred and twenty paces, we arrive at a gate leading into "Tile Hill Wood" on the right [now a Nature Reserve]. A footpath leads through the wood - taking this, we begin a cross-country tramp. Of course, we are warned by a prominent notice affixed to the first high tree that we come to that "all persons found trespassing in this wood will be prosecuted - BY ORDER !" but we must interpret this in a liberal spirit and not go after game. Presently another footpath branches off from ours to the left, but we keep straight on. For different persons a wood has different attractions, but chief among these is the calm restfulness that pervades the whole surroundings, and we cannot help lingering to enjoy this feeling, especially when we come to a small pond which has sloping mossy banks. We startle a squirrel, which darts across our path and up a tree. The footpath is not of the best, but it is cool, being flanked on one side by a rippling streamlet. The wood has been newly planted in places with young trees, while the decayed stumps of the old ones attest the fact the wood itself is not new. From the wood we enter a green lane which skirts the wood at right angles to the path we have been traversing, and we turn to our left, eventually reaching Broad Lane, the main road leading from Coventry to Berkswell, at a point beside the "Hawthorn Tree". We turn to our right, but instead of walking straight back to Coventry along Broad Lane, we climb over a stile on the opposite side of the lane a few paces further on and make for "Eastern Green".